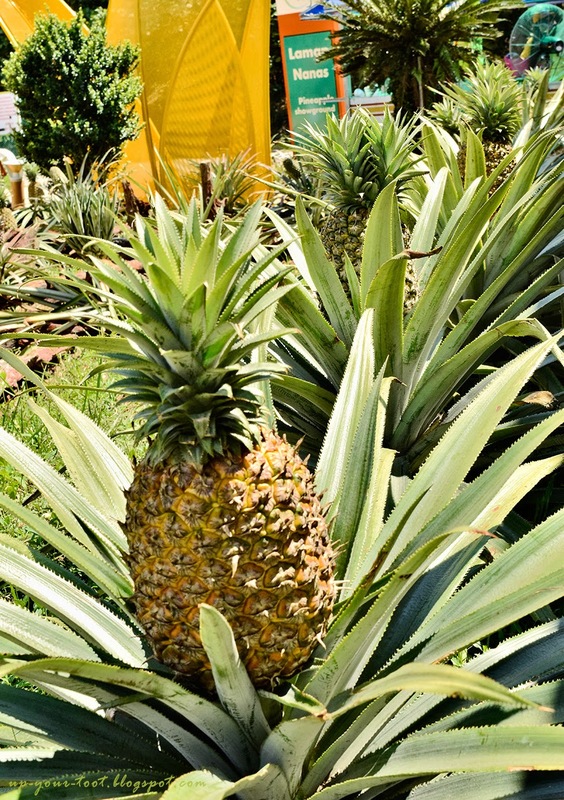 At the Pineapple Showcase grounds in MAHA 2014 at MAEPS Serdang, one of the pineapple that was planted along the paths to the information center was an eye-catching, humongous pineapple. 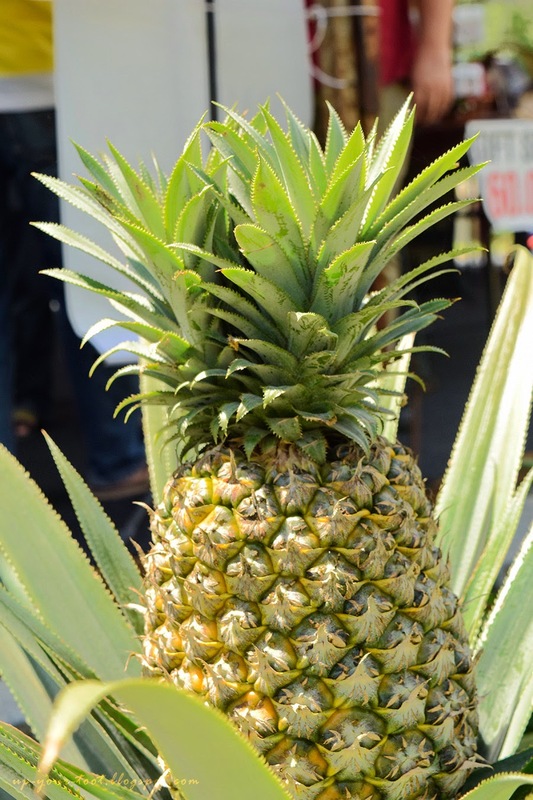 Some of these pineapples also have abnormal double or fused crowns. The plant immediately reminded me of a little Agave plant, with a large fruit sticking out on top. After looking around for the plant labels, I finally found one staked next to one of these pineapple plants. They were Moris Gajah (literally Elephant Moris) pineapples. They basically look like a large varietal form (the on steroid version) of the more commonly found Moris pineapple. Moris Gajah - Elephant Moris pineapple. Everything seems to be big for this cultivar, the leaves, the fruit, the crown and even the thorns. The wild, not so interesting ancestors of our modern day pineapples are native to Southern Brazil and Paraguay. They were apparently domesticated by the natives there and spread northwards to South Central America and the West Indies. From there the Spaniards spread it to the Philippines. Then it spread to India through the Portuguese and onward to Europe, China and the rest of the world. Today, various cultivars of pineapple exist in the world, but they can be group into four main groups or classes - Smooth Cayenne', 'Red Spanish', 'Queen', and 'Abacaxi'. Moris pineapple (also know as Mauritius or Malacca Queen) belongs to the Queen group of pineapples. The fruits are typically pyramidal and tapering to the top, and are commonly used as fresh fruit over here in Malaysia. Fruits usually weight between 800gms to 2.0 kg, and are crisp and have sugar content of 12%-14% Brix. The Moris Gajah is similar to the Moris pineapple in terms of the sugar content, but differs in the individual weight of the fruits - they can weigh a hefty 3kg to 6kg per fruit! Imagine how many slices of pineapple you can get from a single, 6kg fruit! Characteristics of Moris Gajah pineapple - note the fruit weight (from cultivar brochure published by MOA - Malaysian Pineapple Board). One downside of this cultivar is of course the thorns. 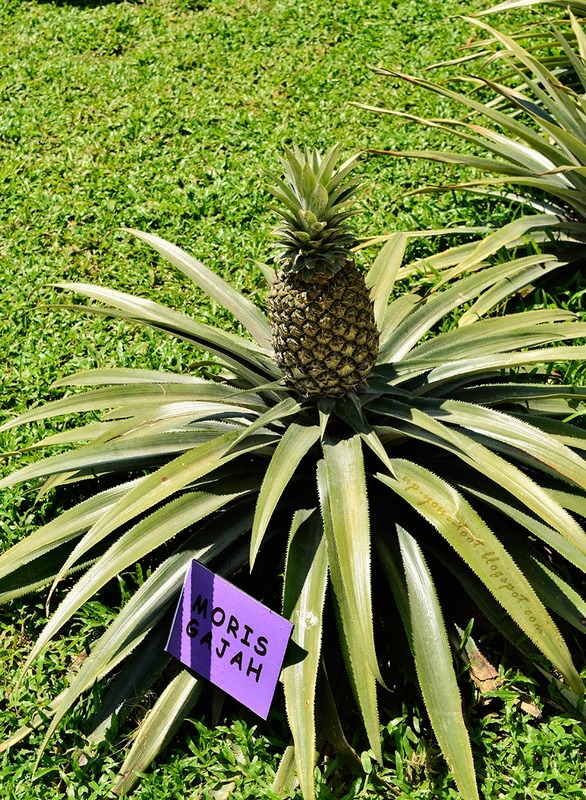 Moris pineapples (or rather most of the pineapples in the Queen group) have thorny leaves, but boy do the Moris Gajah pineapples have thorns. They are sharp, big and form a complete row on each side of the leaf blade, very much like a saw blade. Love the double crowns on top of this Moris Gajah pineapple. Imagine tying some red ribbons around it and presto - Chinese New Year decorative plant! Despite the thorns, I could see that this pineapple also has a decorative potential, if you have the space for it. They look like a miniature Agave plant, and with the huge fruit sitting on top, they definitely will be a good showcase or accent plant in a spacious garden. Thorny pun angsa-angsa tu boleh kerjakan togel daun dia kalau tak bubuh dalam sangkar. This cultivator macam the fruits seats on top of the plant like wearing skirt. Different from the Nanas Madu Sabah we're growing. Is this the one you're growing in a pot now? Nanas madu sabah takes a while to bear fruit tapi top dia kekadang sampai lebih 5 cantum pun ada. I was having a read about pineapple category characteristic because suddenly got interested after cleaning up the bonglai hantu area found many Nanas Madu Sucker (sulur tanah) growing out of no where. I just realised that Nanas Sarawak (@nanas paun) is Cayenne, suspect that Nanas Madu Sabah might be Spanish and now dreaming of having a Queen so that I can see for myself the difference in growing them first hand. Thank you for the ' tin tin'.